Today marks 365 consecutive days of above normal Antarctic sea ice. According to climate geniuses Jeff Masters and Bill McKitten, the odds against this are an astronomical 2^365 to one. A few weeks ago, NSIDC featured an article explaining how declining sea ice cover threatens Penguins. Apparently they forgot to check the data before publishing that article. Every idiot know that warmth causes more ice, snow and cold. Or whatever! I know this comment will not be popular, but in a sense, yes. Warming does cause more surface sea ice. Water freezes more readily as its salinity decreases. Melting ice will mean less salt at the surface of the ocean. There has also been more precipitation than usual over Antarctica this year further increasing this effect. You may notice this article only talks about surface ice. The graphs are the same as they show measurements in square kilometers instead of by volume. That is accurate. We have more ice on the surface. But, “Old ice” the ice that does not melt and reform every year is still melting. There is more ice on the surface, but less ice overall. I am fine with keeping Global warming a healthy debate, but this is not good evidence to counter any of the scientific claims about it. It is a half-story that is enough to be convincing to those who have done no research into the subject. Makes perfect sense. Areas of Antarctica at lower latitudes, elevations and freezing points are gaining ice, but areas at higher latitudes, elevations and freezing points are melting. I really hope you aren’t as irrational as you pretend to be. I’ll bet your ice cube melts from the inside out too. @StevenGoddard, For some reason, I do not have a reply link on your comment, so I hope this finds you. But I am not quite sure what you are criticizing me on or how you read my comment as ice melting from the inside out. I can agree that ice disappears faster from higher altitudes from erosion and gains will mostly be seen at lower altitudes, but how is that a commentary on my description of how sea ice forms? I admit I am no scientist and would welcome any corrections to my understanding of how this works, but even Nasa and the ESA just yesterday released findings that antarctic ice sheet is rapidly losing mass even as it gains surface area. although admittedly this is over a 20 year period while this article focuses on just the last year. Ice is expanding at the warmest parts of Antarctica (the periphery) That is also the place where the ice has the lowest melting point. If the warmest places are gaining ice, than it doesn’t take a rocket scientist to figure out that the interior is not melting. Oh, that is the source of the confusion. You thought I was talking about the surface an ice mass when I was talking about ice on the surface of the ocean. 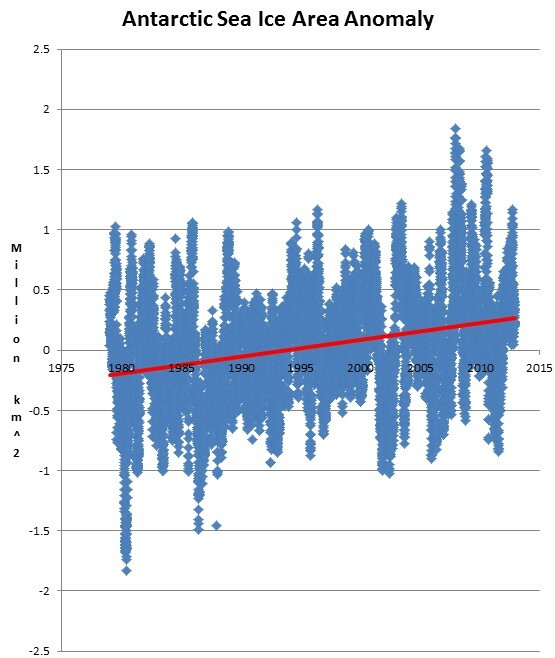 The graphs you gave us plot ocean surface ice growth and I was trying to say that is not an indicator of what is happening to ice at greater depths. And what sources I can find actually say that this old ice is shrinking. Penguins studying visiting climate scientists to Antarctica conclude they are completely bonkers. 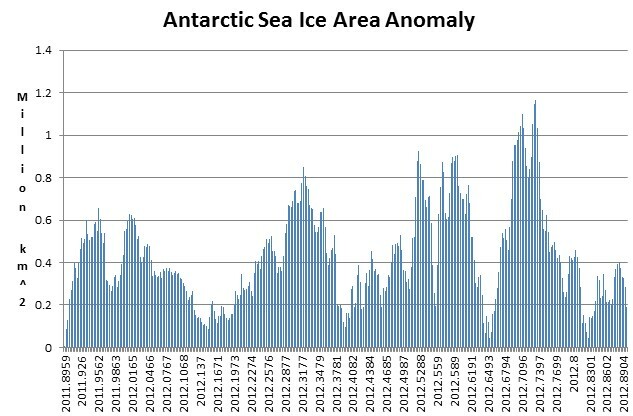 now this is a classic, NSIDC have said that declining land based ice in the Antarctic is due to warmer water at depth around the coast, trouble is the sea ice is increasing., That magic, warmer water heat must jump over the sea ice. It is related to Trenberth’s missing heat, which sank to the bottom of the ocean undetected by sensors on the way down. There is also volcanism in the area they are discussing so that could be a contributing factor. Oh, please no…it will NEVER melt. I need all the amunition I can get! The public educational system is teaching this stuff as fact and yet it is unproven. I tutor and my students believe this stuff forced on them from about the third grade on as fact (at least in my state). So, happy follower I am now. Oh, BTW, found you as posted via Wallbuilders/David Barton. It is a battle. I haven’t figured out if these people are primarily dishonest or stupid, but either way they need to stop polluting children’s minds. Steve, spend a few hours reading activist websites… genetically modified foods will kill us, Chernobyl killed a zillion people (when the attributable deaths was under 100). Animal rights groups want to ban the ownership of pets or giving them voting rights, or we should all become vegetarians, or something. The list is endless. AGW is big right now because it’s a fad that the public is interested in, green groups have captured the balance of power in many jurisdictions, and governments see new opportunities to raise taxation with minimal political fall out. Other activist causes don’t enjoy these benefits presently. You folks still think this is about the weather! It’s about carbon and it doesn’t matter if the carbon levels are normal or not. The person that controls the carbon controls EVERYTHING! One of the problems we face is that a large portion of the historically respected ‘scientists’ have been co-opted by the Liberal/Progressive Green movement, through control of and awarding of scientific grant money. They either ‘Toe the Green Line’ or grant money disappears. When scientists are threatened with censorship and worse because they dare to question scientific claims and are told that the ‘Science Is Settled’ and that any further scientific inquiry is not required, true scientific inquiry is dead. It’s a really important historic mark, but of course the MSM will NOT say a single word about it. ps. : look what happened in 1999-2000, how fast the anomaly changed downward and stayed there! “Weather” (Phil) is expecting a new “step change” to happen now in connection with a series of oscillations/changes, mainly in air/oceanic circulation, that are about to manifest in the near future. His thread at “westernusawx” is a *must-read* IMO. Wilma you are right! Scary stuff. Wake up people.